The two paths we have followed until now—the documentary evidence on the one, back through the centuries from the start of the Christian era, the Egyptian historical evidence on the other, down through the centuries— have both brought us to the same point in history, the fourteenth century B.C. This was the time of Moses receiving the Lord's commandments and appointing Joshua to be his successor, on the one hand, and Akhenaten leading the Amarna religious revolution and appointing Tutankhamun to succeed him on the throne of Egypt, on the other. As we saw earlier, no evidence exists to support the view that the four Christian gospels give an historical account of the life, suffering and death of a physical Jesus. According to the Gospels, nobody saw Jesus, they only saw Christ, which means his spiritual not physical element. * In contrast, we have examined a great deal of evidence indicating that he lived many centuries earlier. Who was he? *When Jesus asked his disciples whom did they think he was, "Simon Peter answered and said, Thou art the Christ, the son of the living God" (Matthew 16:16). anointed king; spent his early manhood in Egypt; died young; and was hanged because he was accused, rightly or wrongly, of having "led astray and deceived Israel." Of all the prominent figures who graced the fourteenth century B.C., of only one can it be said that all of the above criteria are to be found in his life—the charismatic Tutankhamun, murdered in Sinai when he made his way there on an ecumenical mission to preach peace and tolerance of the fact that not all men share the same perception of God. It is, I believe, an unconscious recognition of the truth about his identity that impels millions to visit his tomb in the Valley of the Kings each year in what might be described as a form of pilgrimage, and more millions to queue for hours to view, whenever they are on international display, the treasures recovered from the tomb by Howard Carter and his workers after he discovered it in 1922. There is little to be seen in the tomb itself. After walking down a short tunnel, whose wall-paintings have suffered some damage from the moist breath of the endless millions of tourists, one is simply left facing a wall behind which lies an enclosed coffin containing the skeleton of the young king. In the course of this short walk one comes to a wall-painting whose profound significance had escaped me until November 1997 when I was invited by General Mohamed Yusef, the then governor of Luxor, to speak in the city hall as part of the seventy-fifth anniversary celebrations of the tomb's discovery. Afterward I was privileged to have a private visit to the tomb. As I stood alone, gazing at the painting of the burial chamber on the north wall of the tunnel, I realized for the first time that I was looking at the strongest pictorial evidence linking Tutankhamun and Jesus. The painting, unique in all my experience (no similar representation has ever been found in Egypt), is divided into three separate scenes. To appreciate their profound significance it is necessary to understand the conventions of royal pictorial art in ancient Egypt. The ruling Pharaoh was depicted during his life as Horus, who was looked upon as the embodiment of the divine and protector of the reigning king. After death he was shown as a mummified, risen Osiris, god of the underworld and the father of Horus. Statues and paintings also depicted the ka—the spirit—of a king, which came into existence at the moment of birth and survived his death. 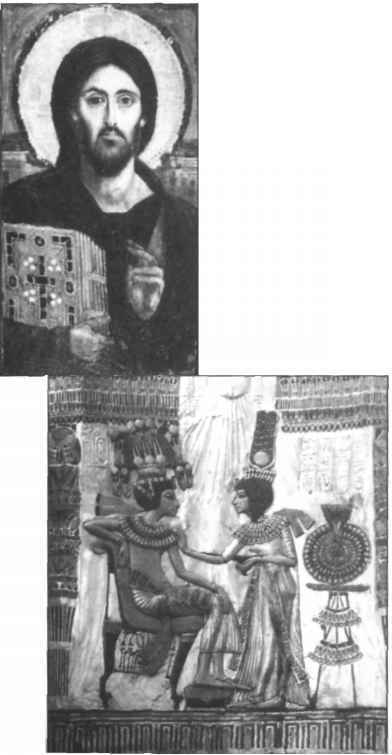 The first of the above scenes, on the right (Plate 17), shows Aye (Ephraim, who was the second son of Joseph the Patriarch as well as the great-uncle of Tutankhamun). He also served as the young king's vizier and succeeded him on the throne. Aye is wearing a crown, with his cartouche above him, indicating that he had already assumed the role of a ruling Pharaoh. Nevertheless, at the same time as being depicted as a king, Aye is shown as officiating as a priest, dressed in a priestly robe of leopard skin and performing the ritual of "the opening of the mouth" for resuscitation of the dead Tutankhamun, who faces him as a risen Osiris. The middle scene (Plate 18) shows Tutankhamun entering the realm of the gods and being welcomed there by Nut, the goddess of heaven. It was the ultimate scene on the left of the north wall, however, that aroused my wonder. Here I saw three different representations of Tutankhamun, linked as one person. On the left of the scene (Plate 19) stood Tutankhamun as the risen Osiris and a second Tutankhamun, facing him as the ruling king, Horus. Behind him is a third Tutankhamun depicted as his ka. The most remarkable feature of this scene is the fact that the risen Osiris, although shown in the conventional mummified form, with his hands folded across his chest, is reaching out to touch Horus, as is his ka. Thus we have Tutankhamun as father, son and spirit—the same relationship that we find in the Christian Trinity of three persons in one God— Father, Son and Holy Spirit—finally established as orthodox belief after much acrimonious debate during the first four centuries of the Christian era. 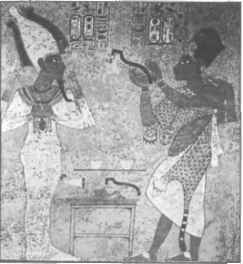 The fact that Aye, a ruling Pharaoh, was officiating as a priest also indicates that we are in the presence of a theology that was beyond the powers and understanding of priests of the state god Amun-Ra. Sigmund Freud is not the only distinguished scholar to have come to the conclusion that there is more to the biblical story of Jesus than meets the eye. 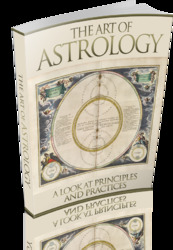 Attempts to establish his identity date back to the eighteenth century, the Age of Enlightenment, when scholars sought to apply critical and rational thought to assumptions previously taken for granted. By 1906, when Albert Schweitzer, the French theologian, organist and surgeon-missionary, wrote his classical—and critical—study The Quest of the Historical Jesus, it had already become clear that many scholars who had embarked upon this quest had portrayed a Jesus based largely upon their personal presuppositions or the widely accepted beliefs held by the society in which they lived. Schweitzer's study, in which he argued that the Jesus recognized in Protestant liberal theology of the nineteenth and early twentieth century bore little resemblance to the Jesus of history, had a profound effect. Many New Testament scholars refused to produce lives of Jesus or to attempt studies of the orthodox—that is, generally accepted—account of his ministry. This situation has changed since the Second World War. Renewed scholarly interest in the matter has produced many new books, with more in the pipeline, that have presented Jesus in a variety of guises—a political revolutionary, a gay magician, a Galilean rebel, a Pharisee, an Essene, an apocalyptic (revelatory) fanatic or an eschatological prophet, putting forward doctrines about death, judgment, heaven and hell. It is remarkable that one historical figure should inspire so many conflicting identifications. If, charitably, one assumes that the authors involved were trying sincerely to establish the truth, their failure to arrive at broadly similar conclusions may lie in the fact that they were trying to reconcile facts that, on closer analysis, prove to be theological rather than historical facts. Tutankhamun, the 10-year-old son of Akhenaten (Moses), came to the throne of Egypt as sole ruler in 1361 B.C. after the abdication of his father and the disappearance of Semenkhkare. Some doubts have been expressed— as seems to be common about any aspect of the Amarna period—about the parenthood of the young king, who at this time bore the name Tutankhaten. These matters are not difficult to resolve. A linen shirt, found in his tomb and dated to Year 7 of Akhenaten (1372 B.C. ), indicates that this was the year of his birth. Akhenaten (Moses) had a co-regency with his father, Amenhotep III (Solomon), for 12 years, then ruled alone for five. The birth of Tutankhamun in his father's Year 7 would make him 10 years of age when he came to the throne and 19 when he died at the end of his short reign. These dates are confirmed by anatomical examination of his body as well as by the dating of objects found in his tomb. As for his mother, some scholars have suggested, without any evidence to support their argument, a different mother from Queen Nefertiti for the young king. It has been argued that he was Akhenaten's son by another wife named Kia. However, the late German Egyptologist Hans Wolfgang Helck was able to show—at the sixth International Congress of Egyptology, held in Turin in 1991—that Kia was another name given to Queen Nefertiti and produced a scene showing her depicted under this alternative name. Before the birth of Tutankhamun, she had three daughters, and another three afterward. No evidence of other sons has been found. The archaeological remains of Amarna's northern palace offer strong evidence of her parenthood. 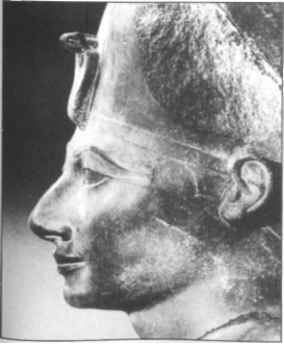 They indicate that Nefertiti did not accompany Akhenaten into exile in Sinai but remained with her son, Tutankhamun, in Egypt at least until the time of his early death. During his brief reign, Tutankhamun—who married his sister, Ankhsenpa-aten, in order to inherit the throne—was able to rely for guidance and support, as had his father before him, on his great-uncle, Aye (Ephraim), the second son of Yuya (Joseph). Aye was the most powerful man in Egypt—the young king's vizier and the strong military presence behind the throne as Commander of the Chariots, Master of the King's Horses and Chief of the Bowmen. For the first four years of his reign, Tutankhamun continued to live at Amarna, the capital city built by his father. However, he stopped all attempts to enjoin worship of Aten on his subjects. Nefertiti was still referred to as the "Great Royal Wife," further confirmation that Akhenaten was still alive and regarded, at least by some of his followers, as king. During this period the young king also began building activities at Thebes, where he made additions to the older Aten temples, constructed originally by his father. 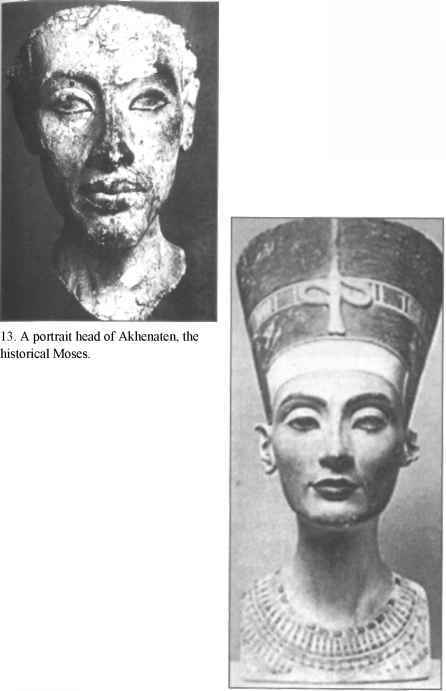 Further confirmation that Akhenaten was still alive at this time is provided by the fact that none of the ancient gods of Egypt feature in these constructional changes at Thebes, only the name of Aten. The second stage of Tutankhamun's reign, starting at some point in his Year 4, saw the young king, now about 15 years of age, move his residence from Amarna to Memphis, southwest of modern Cairo. It was then that he allowed the temples of the ancient gods of Egypt to reopen and the gods to be worshipped alongside Aten. The popular response brought home to him the fact that the majority of his people did not share his own beliefs. He therefore, in this third stage of his reign, changed his name—in recognition of the state god Amun—from Tutankhaten to Tutankhamun while his queen became Ankhsenpa-amun. The priesthood was given formal recognition, temple income was restored and work was begun on making good the ravages wrought by years of neglect. As sovereign over the whole of Egypt, Tutankhamun was looked upon as beloved of Amun of Thebes, Ra of Heliopolis, Ptah of Memphis and all the other deities. Nevertheless, the king himself remained an Atenist until the very end. 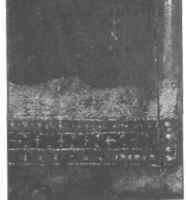 This can be seen clearly from the scenes on the back panel of the throne (Plate 21) found in his tomb in the Valley of the Kings. This wooden panel—overlaid with gesso and gold, silver leaf, and inlaid with colored glass and faience—shows the king and queen in an intimate scene. Both are wearing coronation crowns and garments of silver. The standing queen is anointing the seated king with perfume from a vessel held in her left hand. Although it is clear from one of the cartouches placed behind his crown that the king used this throne after he had changed his name, it is obvious that he still adhered completely to the Aten faith for, top center, we see the symbol of the Aten with its extending rays that give the ankh, the Egyptian key of life, to the royal pair. Aten is here represented as the sole God, with his two cartouches of a ruling king of the universe dominating the scene. Howard Carter, who was struck by this fact, commented in his book The Tomb of Tutankhamun: "It is curious, to say the least of it, that an object which bore such manifest signs . . . should be publicly buried in this, the stronghold of the Amun faith ... It would appear that Tutankhamun's return to the ancient faith was not entirely a matter of conviction." This is confirmed from a text found on other objects in the tomb furniture that, after mentioning some of the important Egyptian deities, ends with the statement that Tutankhamun was the "eldest son of Aten in Heaven." Yet, despite his efforts to heal the religious wounds inflicted upon Egypt by his father's introduction of the monotheistic God, Aten, Tutankhamun was murdered. Further investigation showed that the limbs were broken in many places as well as being detached from the body. The right arm had been broken at the elbow, the upper arm being separated from the forearm and hand . . . The left arm was broken at the elbow, and in addition at the wrist... The left leg was broken at the knee. The right leg was intact . . . The heads of the right humerus [bone of the upper arm] and both femora [thigh bone] had been broken off the remains of the bone ... The head and neck had been distracted from the torso at the joint between the seventh cervical and first thoracic vertebrae. *Although it can be only a matter of conjecture after the passage of so many centuries, this sweet scent is reminiscent of the odor of sanctity said to emanate from the body of many men of exceptional holiness, such as Padre Pio, whose saintly qualities made San Giovanni Rotundo a place of renewed pilgrimage in modern times. clenched together . . . The radiographs of the thorax confirmed the fact that the sternum and most of the ribs on the front of the chest had been removed." The age at the time of death is thought to have been about 18 and the height of the body 5 ft. 6 1/2 in. : "It is of interest that the heights of the two statues of the young king, which stood on either side of the sealed door leading to the burial chamber, are within a few millimetres of the height estimated above." The examination also confirmed the refined looks reflected in his golden mask: "All present at the exposure of the king's remains agreed with Howard Carter's description of a 'refined and cultured face' and a 'serene and placid countenance.'" The examination failed to find any evidence of disease as the cause of death, and it is clear from the state of his remains that Tutankhamun did not die of natural causes but must have been exposed to severe physical torture, then hanged. When in 1992, in my book The House of the Messiah,* I concluded, relying on this report by Professor Harrison, that Tutankhamun had been killed, no one seemed to agree. Nevertheless, after examining Dr. Harrison's X-rays, many scholars have come recently to accept my view. Bob Brier, Professor of Egyptology at the Long Island University, New York, studied X-rays of Tutankhamun's fractured skull, following the publication of my book, and accepted my conclusion that the young king was killed. In his book The Murder of Tutankhamun, published in 1998, though, he identified Aye (the king's vizier and Commander of the Chariots) as the one who killed him rather than Panehesy. His reason for this identification, he argued, was Aye's motive to replace Tutankhamun on the throne. On the contrary, I regard Aye, Queen Tiye's brother, as the protector of his nephew Akhenaten as well as his son Tutankhamun, whose main motive was to save the Amarna rule from collapse. The Old Testament contains two garbled accounts of the death of Tutankhamun, one featuring Moses and Joshua, the other the priest Panehesy/Pinhas under yet a third form of his name, Phinehas. *Reprint edition published in 2004 under the title Jesus in the House of the Pharaohs. of God" (Exodus 24:13). In his absence, the Israelites are said to have gathered together all their earrings, made a golden calf and worshipped it. We find an indication of conflict in the words said to have been used by the Lord when he subsequently instructed Moses and Joshua to return to the foot of the mountain: "I have seen this people, and, behold, it is a stiffnecked people. Now, therefore let me alone, that my wrath may wax hot against them ..." (32:9, 10). As they descended from Mount Sinai, Moses and Joshua heard the noise of celebrations and Joshua commented that "the noise of them that sing do I hear" (32:18). Moses was so angry over what had happened while he was away that he cast down the tablets bearing the Ten Commandments and shattered them (32:19). The Lord therefore summoned him to a second meeting on the mountain to replace the broken tablets.
. . . And there was a cloud that overshadowed them: and a voice came out of the cloud, saying, This is my beloved Son: hear him. And suddenly, when they looked round about, they saw no man any more, save only Jesus with themselves . . ."(Mark 9:2-4, 7). Christian authors avoided trying to interpret the meaning of this account until the nineteenth century. It was then explained away as not being a description of actual historical events, but rather a matter of the psychology of Jesus and His disciples or having been a "spiritual experience." However, the factual nature of the gospel narratives themselves does not permit this interpretation. Unlike the confrontation with Satan, when Jesus was alone with a fallen angelic being, the Transfiguration cannot be interpreted as symbolic or a description of a vision. Here we have three disciples who are said to be witnesses to a meeting between Jesus and Moses, an event that is the only clue in the gospels to the era in which Jesus lived. That there was more than one "tradition," separated by many hundreds of years, about when the Transfiguration occurred is indicated by a mosaic in the monastery church of St. Catherine, built at the foot of Mount Sinai in the last years of the sixth century a.d. (Plate 26). In the sanctuary apse off one of its chapels, the Chapel of the Burning Bush, we see contrasting depictions of the Transfiguration. Christ is portrayed, with black hair and beard, in an oval glory, between Moses and Elijah. At his feet stand three apostles, Peter, James and John. 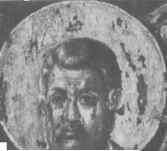 In the accompanying medallion the three apostles have been replaced by three other apostles, Paul, Thaddaeus and Matthias. *At a meeting with me in June 1996 Archbishop Damianos of St. Catherine's monastery confirmed this as the site of the Transfiguration scene. That an Israelite leader was killed in Sinai at around this time is not a new idea. It was, as we saw much earlier, voiced by Sigmund Freud, who identified Moses, wrongly, as the victim. The same is true of Ernest Sellin, the German biblical scholar. In his book Moses and His Significance for Israelite-Jewish Religious History he described the killing as "the scarlet thread" running through Israelite history. Sellin based his conclusion on a chapter in the Book of Numbers that features Phinehas. The story in Numbers tells how, after Israel had been locked in combat with the tribes of Moab and Midian, a number of Israelites began "to commit whoredom" (25:1) with Moabite women, who invited them to "the sacrifices of their gods: and the people did eat, and bowed down to their gods" (25:2). This, it is said, angered the Lord (25:3). Then "one of the children of Israel came and brought unto his brethren a Midianitish woman in the sight of Moses, and in the sight of all the congregation of the people of Israel, who were weeping before the door of the Tabernacle of the Congregation. And when Phinehas, the son of Eleazar, the son of Aaron the priest, saw it, he rose up from among the congregation, and took a javelin in his hand; and he went after the man of Israel into the tent (tabernacle), and thrust both of them through, the man of Israel and the woman . . . (25:6-8). For these actions, Phinehas is presented to us as a hero. As a result, a "plague" that had cost the lives of 24,000 people was brought to an end, and the Lord spoke to Moses, saying: "Phinehas, the son of Eleazar, the son of Aaron the priest, hath turned my wrath away from the children of Israel, while he was zealous for my sake among them, that I consumed not the children of Israel in my jealousy. Wherefore say, Behold I give unto him my covenant of peace. And he shall have it, and his seed after him, even the covenant of an everlasting priesthood; because he was zealous for his God, and made an atonement for the children of Israel" (25:11-3). A few verses later the victims are identified as minor figures—Zimri and Cozbi, the son and daughter respectively of two chiefs. If one analyzes this account, it is easy to see why Sellin suspected that it had been subjected to some priestly sleight-of-hand in the editing to cover up what had actually happened. An ordinary Israelite would not have taken a foreign woman into the inner room of the tabernacle, where only a king or high priest was allowed; there is no mention of the man in this case worshipping another god; making love to a woman was not punishable by death; Moses, the Israelite leader, did not give any orders for action against the man, and, if the male victim was a minor figure, why would it require revenge in the form of the death of 24,000 people? It is no wonder that Sellin commented that "despite the efforts of the priests, to suppress the sordid story, it nevertheless lived in prophetic circles." It is clear that, as what is described as a plague is mentioned only after Phinehas had committed the killing, it was a punishment for the assassination, not for worshipping false gods. Paul had this in mind when, after indicating that Christ was present with the Israelites in Sinai, he went on to say: "But with many of them God was not pleased . . . and fell in one day three and twenty thousand" (Corinthians 10:5, 8). This understanding is reinforced by the evidence available from the Dead Sea Scrolls. The Commentary on Habakkuk, one of the Qumran texts, tells us that, after The Wicked Priest had killed The Teacher of Righteousness, "he (the Teacher) appeared before them to swallow them up. "* "Swallow up" is a Hebrew metaphor for "do away with" or "kill." 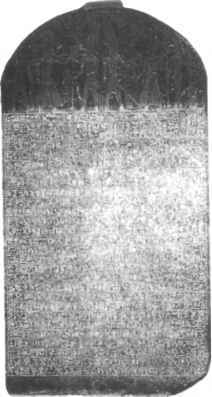 As for the appearance of the Teacher after death, "the Hebrew verb used here may also be translated as 'he revealed himself to them'"— indicating a spiritual rather than an historical appearance. Further support for the theory that the "plague" that followed the Sinai assassination was a form of punishment—and for the moment in history at which the assassination took place—is to be found in the Book of Hosea, where this punishment is said to have been carried out by Ephraim (Aye, Tutankhamun's vizier and head of the chariotry): "When Ephraim spake trembling (the sense here, given in other translations, is caused others to tremble), he exalted himself in Israel . . ."(13:1). It is also curious that Phinehas should have been rewarded with "the covenant of a perpetual priesthood to him and his descendants after him" when we know from the previous book in the Pentateuch, Leviticus, that this promise had already been made to Aaron and his descendants. Establishing the truth about these events at the foot of Mount Sinai is difficult because, as we shall see, elaborate efforts were made down the centuries to conceal that truth. In the meantime, what was the "crime" of Tutankhamun that brought him to such a violent end? In other words, why was he killed? *The Essene Writings from Qumran, Andre Dupont-Sommer. 1. 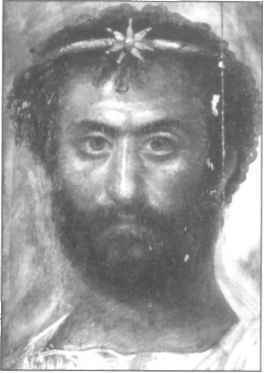 A priest of Serapis, the Egyptian god whose cult was based at Alexandria. This painting, from the Fayyum area in the Western desert, dates from the mid-second century a.d., well before all traces of Egyptian influence were eradicated by the Roman Church in the early fifth century. 2. Tuthmosis III, the historical David, who established the first empire that extended from the Nile to the Euphrates. 3. 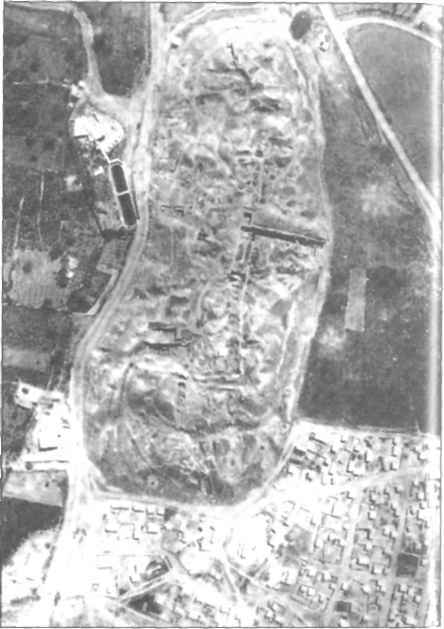 An aerial view of the mound Tell el-Sultan at Jericho, showing trenches dug by Kathleen Kenyon's expedition 1952-58. The evidence of this excavation work shows that the location was virtually uninhabited during the time of Joshua. The battle of Jericho is therefore sheer invention. 4. 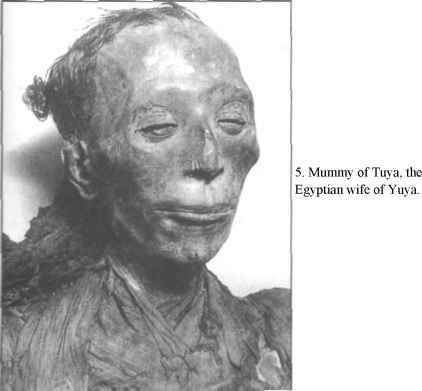 Head of the mummy of Yuya, the historical Joseph. 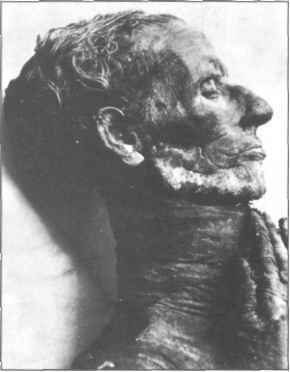 His strong, aquiline features and hooked nose suggested at once to those who examined the mummy that he was of foreign, possibly Semitic origin. 6. The marriage scarab of Amenhotep III and his Queen Tiye, Yuya's daughter. 7. 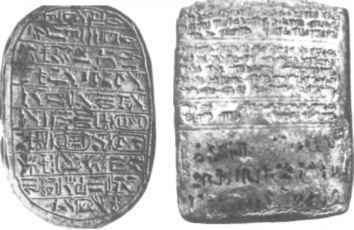 Tablet of sun-dried clay impressed with cuneiform signs, one of the dispatches from Tushratta, King of Mittanni, to Amenhotep III, the historical Solomon. 8. 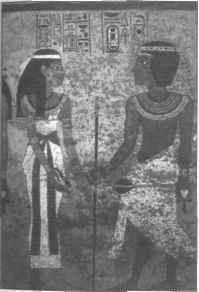 (Left) Merenptah's great victory stele, known as the Israel stele. In the second from last line occurs the only reference to Israel in Egyptian literature. (Below) The hieroglyphic name for Israel. 9. Amenhotep III, the historical Solomon. 10. 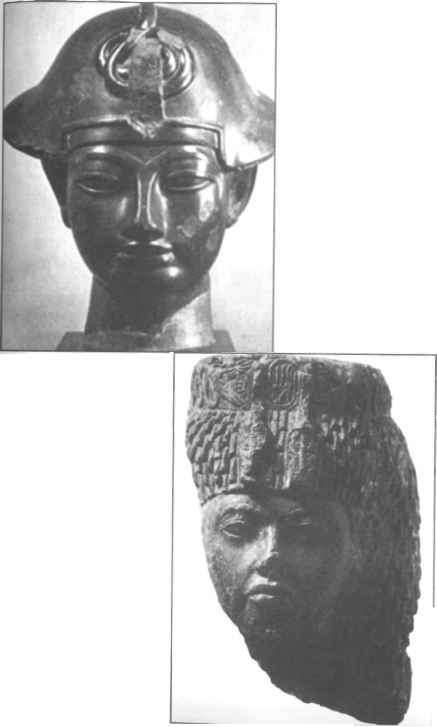 Head of Queen Tiye, daughter of Yuya, the historical Joseph, and mother of Akhenaten, the historical Moses. 11. An icon at St. Catherine's monastery, Mount Sinai, depicting Moses as a young man receiving the tablets of the Law at the Burning Bush from which the Lord spoke to him. 12. Akhenaten, the historical Moses, and Nefertiti, the historical Miriam, with their three eldest daughters. 14. The famous bust of Nefertiti, the historical Miriam, in the Berlin Museum. 15. 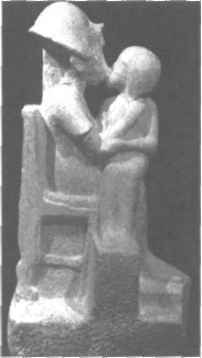 Unfinished statue of Akhenaten kissing one of his daughters. This statue was believed by those who claimed that the younger figure portrays Semenkhkare, the king's brother, to be evidence that Akhenaten was homosexual. 16. 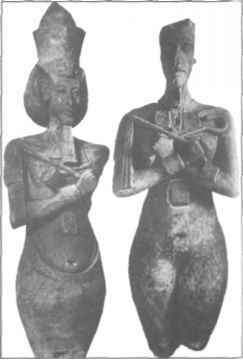 Two statues of Akhenaten as Osiris. The one on the right lacks the royal kilt. The Egyptologist Cyril Aldred interpreted this as evidence that Akhenaten possessed no male genitalia. However, since the statue is unfinished, this assumption is incorrect. The pelvic area would eventually have been carved (as in the statue on the left) to show the kilt. 17. The painting on the north wall of the burial chamber of Tutankhamun, the historical Jesus, includes three scenes. The first scene shows Aye, the historical Ephraim and Tutankhamun's successor, as king, dressed in the priestly leopard skin, performing the ritual of "the opening of the mouth," to resurrect the dead king. 19. The third scene shows Tutankhamun, the god-king, in his three forms: as Osiris, the father; as Horus, the son; and as Ka, the (holy) spirit. 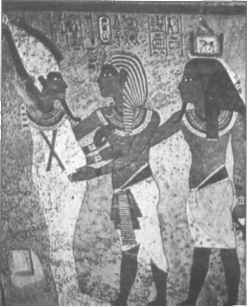 The manner in which the three embrace one another, as well as their identical profiles, emphasizes that they are three in one and one in three - the original Egyptian Trinity. 18. The second scene shows Tutankhamun entering the heavenly realm of the gods, being greeted by the sky goddess, Nut. 20. Christ as Ruler of the Universe. This icon was painted in the first half of the sixth century and is one of the earliest icons in St. Catherine's monastery. Christ was always represented as a king in Egyptian tradition and was never shown dying on a Roman cross. 21. 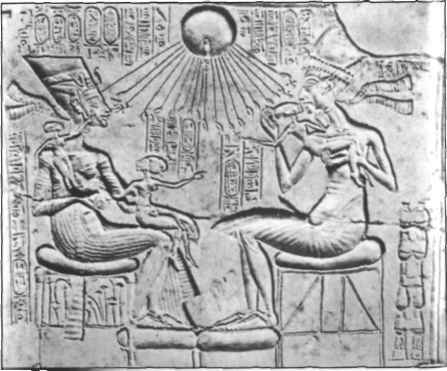 Tutankhamun being anointed by his wife Ankhsenpa-amun. This scene is found on the back of the King's throne chair, found in his tomb. The anointing of Jesus by Mary Magdelene echoes this ritual. 22. Panehesy, the historical Elias, the Chief Servitor of the Aten temple, from his tomb at Amarna. 23. 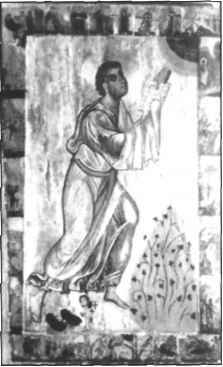 The prophet Elias (Ilia), a painted panel at St. Catherine's monastery, Mount Sinai. 24. Isis nurses her son Horus, whose father is the god Osiris. 25. (Left) At St. Catherine's monastery, Mount Sinai, the Virgin Mary, also enthroned, holds Jesus, the son of God, in her lap. More than a thousand years separate these two portrayals, but the comparison is striking. 26. The scene of the transfiguration at its original site, the main church of St. Catherine's monastery. Christ in the center, with Moses on the right and Elias (Ilia) on the left. Here Tutankhamun, Akhenaten and Panehesy, the historical originals of Jesus, Moses and Elias respectively, are shown, rightly, to be contemporaries. Beneath are Jacob, Peter and John. 27. 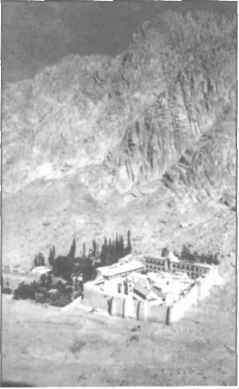 (Right) The monastery of St. Catherine, at the foot of Mount Sinai, where the historical Jesus was hanged on a tree by Panehesy. Biblical and Koranic accounts indicate that this area at Mount Sinai (Gabal Musa, Horeb) had been holy ground even before the time of Moses. Archaeological and traditional evidence also confirm that this site of the Burning Bush remained sacred, visited by pilgrims and occupied by monks, until the monastery of St. Catherine was built by Emperor Justinian in the sixth century a.d. It was in the library of St. Catherine that the Codex Sinaiticus, now in the British Museum, was found. This earliest New Testament text contains the Gospel of Mark, which makes no mention of the resurrection. 28. A representation of St. Peter, at St. Catherine's monastery. 29. 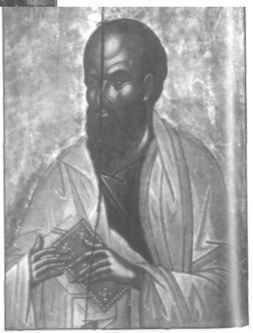 A representation of St. Paul, who was an initiate of the Egyptian Mysteries, at St. Catherine's monastery. 30. (Above left) A unique scene from the Coptic Monastery of St. Macarius at Wadi el-Natrun in the Western desert, showing Christ being embalmed according to Ancient Egyptian customs. As the gospel writers tell us, spices and ointments were used to anoint Jesus's body, and John says that Nicodemus "brought a mixture of myrrh and aloes" and describes Jesus's body being bound "in linen clothes with the spices." 30. 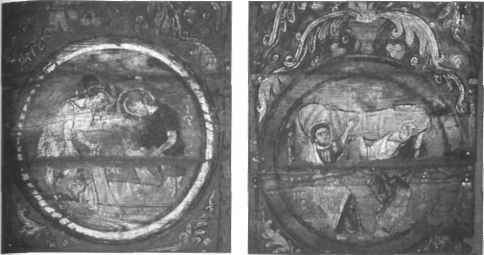 (Above right) Another scene from the Monastery of St. Macarius showing the mummified Christ carried away by the priests. 30. 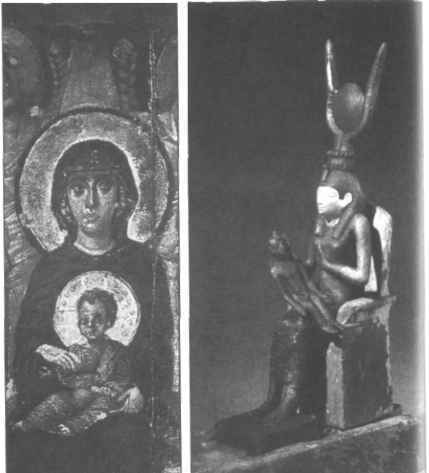 (Left) The Egyptian god Serapis is shown as an angel on the walls of the Coptic monastery of St. Paul at the Red Sea. This is confirmation of the teaching of Tutankhamun when reopening the old temples. It was then that he regarded the old gods as angels and saints, while Aten remained the one god. 33. 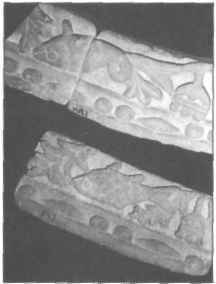 Limestone fragments from the entrance to an Egyptian house dating from the fifth century a.d., now in the Coptic Museum, Cairo, each depicting a fish. 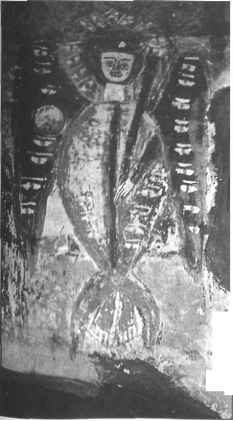 The fish was a symbol of Christ during the early years of the Church. 34. 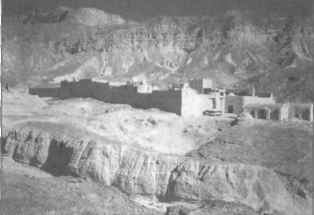 (Above) St. Paul's Monastery, Red Sea. St. Paul was regarded as an important disciple by the Egyptians, and the building of this monastery confirms the belief that Paul himself must have visited this area near Mount Sinai when he went into Arabia. 35. (Right) The obelisk of Tuthmosis III, now in the Piazza San Giovanni in Laterano, Rome. Obelisks together with the hieroglyphics inscribed upon them became a powerful symbol of the Roman universal church at the time of the Counter-Reformation, and signify Rome's acknowledgment of Egypt as the source of faith and theology. Did Nefretiti live in Joshuas days?